DACSEE! No, that is not a typo or misspelling but a new ride-sharing application in Malaysia that may serve as a viable alternative to Grab. 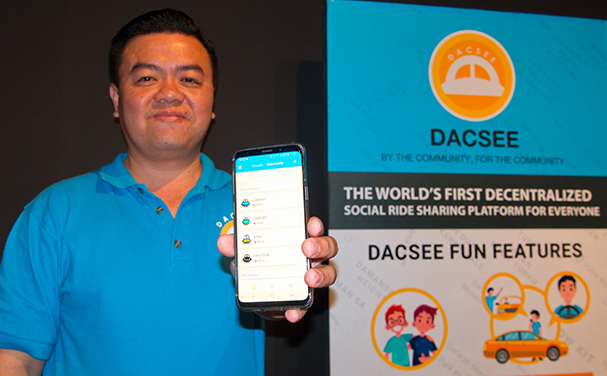 In an interview with Digital News Asia, Dacsee founder and chief executive officer Lim Chiew Shan explained that the new ride-sharing platform does not seek to compete with existing ride-sharing apps in terms of price and speed in matching passengers with drivers. With Uber’s exit from Malaysia in April 2018, this has left consumers with less choice and Lim wants to offer an alternative via Dacsee. He makes the case that there is still room in the ride-sharing space as the projected value of the sharing economy in Malaysia is expected to reach RM17 billion and create more than 300,000 jobs for youths by 2020. “The initial launch we did in January 2018 was to tell Malaysia that we are indeed here but we needed additional time to make adjustments to our backend system hence the complete roll out in June 2018,” he said. He explained that Dacsee wants to leverage on a decentralised system that puts power in the hands of passengers and drivers to build a platform where they set the price of fares based on the service offered. After a user makes a booking for a Dacsee ride, the experience goes beyond just telling the driver where you are and where you want to go. While on a trip, passengers can engage in conversation with nearby Dacsee users to get to know new people and find those who have the same interests. The social aspect of Dacsee is not just for show either as Lim went on to say there is an aspect of safety too. According to Lim, the community aspect of the app is at the core of what differentiates Dacsee from other services. Within this model, Dacsee claims that safety is enhanced as passengers build a relationship with their drivers and eventually become repeat customers. In addition, trips are monitored and in the worst-case scenario there is a panic button within the app that would alert nearby Dacsee users so that they can take action quickly. Dacsee has what it calls “official groups” that vary in terms of vehicle size and fare. This ranges from compact (hatchbacks), comfort (saloons or sedans), executive (full sized saloons) up to extra (6-seater minivans). But the bigger attraction of Dacsee is the formation of user groups, that are vetted by Dacsee themselves. The attraction for forming these individual group according to Lim is that there can be unique groups like foodies, lady drivers or even one comprised of ex-army and police veterans. Since its January launch, Dacsee said they have gathered over 25,000 registered drivers out of which 3,000 drivers have been verified. Lim added that they are engaging with key opinion leaders to build 50 more community groups within the next three months. Though much of their focus will be within the Klang Valley, Lim said there has been great interest from users in Penang and Kuching too. There are also plans for regional expansions to Thailand, Indonesia and China in the coming year, though they want to take it one step at a time to get their formula right in Malaysia first before expanding overseas.